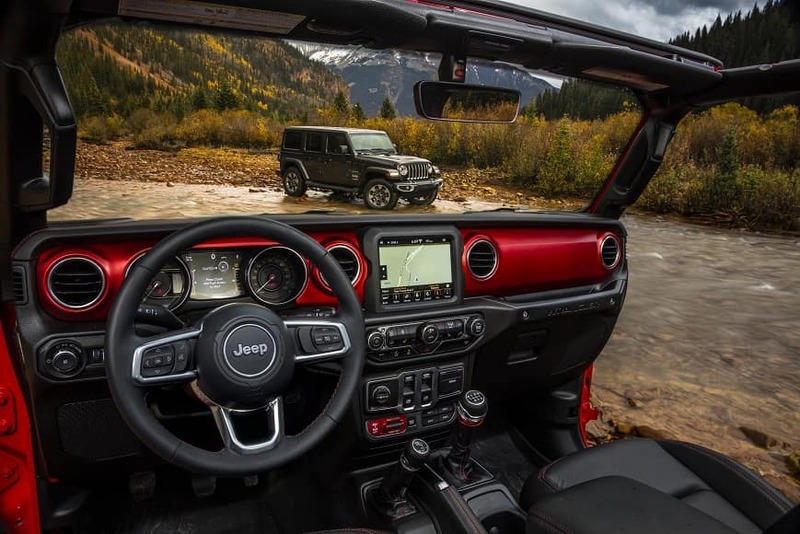 The All-New Jeep Wrangler is true to its heritage, combining tried-and-true features with updated design and materials to deliver a vehicle ready for the future. New lights—including available LED headlamps and taillamps—provide remarkable illumination and a striking appearance. New air extractors have been added behind the fender flares to help cool the engine compartment. The Jeep® Brand badge moves from the hood back to the side of the aluminum fender, a look reminiscent of past models. The All-New Jeep® Wrangler features an easier way to experience open-air freedom thanks to the easily foldable windshield. The fold-down process requires the removal of far fewer bolts than previous models. A new body-color sport bar is part of the permanent windshield frame structure. Redesigned hood bumpers feature cleverly integrated washer nozzles for a seamless appearance. Hardtop, soft top, no top or the new Sky One-Touch™ Power Top. Full doors or no doors. The All-New Jeep® Wrangler is made for easy open-air driving. The new zipperless Sunrider® soft top sports a spring-assist for smooth raising and lowering, while the Freedom Top® hardtop is 20% lighter than previous hardtops. A new multi-length hinge pin system simplifies the removal and installation of doors. Premium LED headlamps, including a LED signature ring, are available on Sahara and Rubicon for a truly distinctive look. The package includes LED fog lamps, tail lamps and daytime running lights on the fender as well. The All-New Wrangler takes inspiration from the Jeep® Brand’s storied history while taking advantage of the latest technology and materials to create an unforgettable interior. New levels of fit and finish combine with rugged details to deliver an unforgettable driving experience. Settle in for the ride of your life in an all-new interior with major upgrades. A new seat design provides comfort and maximum support, while available heated front seats, a driver seat with two-way lumbar adjustment, additional rear seat legroom, premium armrests and more, make every trip one to remember. Open-air freedom is at the heart of every Wrangler. There are big improvements all around for 2018, including a new lightweight Freedom Top® hardtop with easily removable roof panels4. The new zipperless Sunrider® soft top includes improved fabric management and an assist mechanism to help ease the opening and closing process. Our fourth-generation Uconnect® systems include pinch-to-zoom displays, performance improvements, faster startup times, enhanced processing power, heightened touchscreen responsiveness and vivid clarity with improved resolution and brightness. Every 2018 Jeep® Wrangler proudly sports the Trail Rated® badge. To earn the badge, a vehicle must conquer a series of grueling tests over the toughest terrain. These tests prove a vehicle’s ability to withstand harsh conditions and deliver incredible off-road capability. 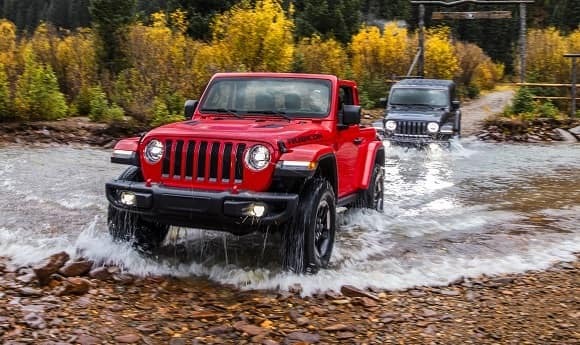 True to its heritage, the 2018 Jeep­® Wrangler has the traction to handle some of the harshest, most unpredictable driving conditions. Transferring power to the ground efficiently is the key. The Wrangler is available with three different 4×4 systems, each designed to satisfy different applications. Over 75 years of 4×4 mastery are all rolled into the 2018 Jeep® Wrangler. Ready for any adventure you’ll throw its way, the Command-Trac® and Rock-Trac® 4×4 Systems provide ground pounding grip while the new Selec-Trac® Full-Time 4×4 System gives you more flexibility and efficiency. The Selec-Trac® 4×4 System features a full-time mode that will automatically switch from 2WD to 4WD when conditions dictate. Relying on internal wheel speed and traction control sensors, Selec-Trac makes driving in uneven terrains and inclement weather safer and smoother while delivering superior efficiency when four-wheel drive isn’t needed. 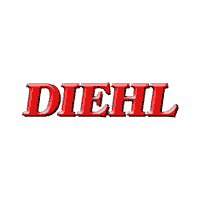 Diehl is your Pittsburgh PA 2019 Jeep Wrangler Headquarters. Serving Butler, Grove City, Robinson Township, and Pittsburgh.